1961 Alfa Romeo Sprint 2000 Owner's Manual. 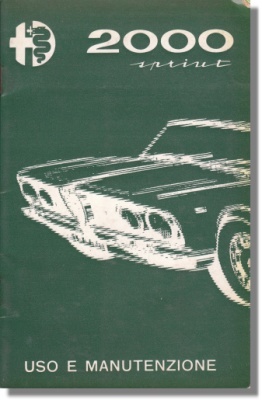 Vintage August 1961 owners manual for the Alfa Romeo 2000 Sprint, the 102 Series that is. It measures some 5 x 8 inches or 13.5 x 21 cm and counts 30 pages and a fold-out wiring diagram. Print reference: N. 761 8/1961 (2000) R1, printed by A.G.M., Milano, Italy. Excellent condition for its age with a slight curl to the right hand top corner of the cover.